The new Trailblazer Lifecard is perfect for discreet carry! It’s a folding, single shot 22LR that weighs less than 7 ounces and is no thicker then a stack of credit cards (0.5″ thick). The Savage 11/111 Trophy Hunter has easily become one of our best sellers. It’s available in many calibers from 204 Ruger to 338 Win Mag. Features a detachable magazine, Accu-Trigger and comes with the Nikon ProStaff 3×9 scope with the BDC reticle. Features a detached box magazine, bolt action and Accu-trigger. It is drilled and tapped for easy mounting of your favorite shotgun scope. Available in black synthetic with blued barrel and camo with either blued or stainless barrel. Prices start at $529.95. The Remington 870 shotgun is one of the most popular pump action shotguns of all time. It is available in 12ga or 20ga with many different options including choice of wood or synthetic stock, 26″ or 28″ barrel, vent rib with choke tube or rifled barrel. It’s also available as a combo (vent rib & rifled barrel) or in a youth model. There are various grades of the 870 as well with the lowest grade being the 870 Express. Check out Remington’s website for a complete list of options – then contact us for availability and pricing. Small bore revolvers. Available in 22LR or 22LR/22Mag combo with a 4 3/4″ or 6 1/2″ barrel. Other grip and finish options are also available. Big bore option – .45Colt & .357Mag with either 4.75″, 5.5″ or 7.5″ barrel lengths. 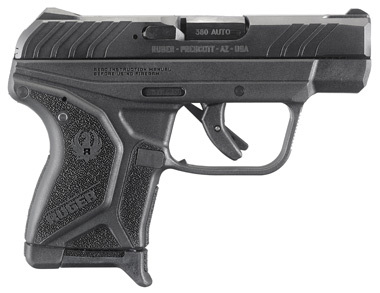 The new Ruger LCPII features upgraded grip panels, improved sights, a blade trigger safety and last round hold open.